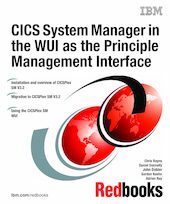 This IBM® Redbooks® publication reviews the CICSPlex® SM Web User Interface (WUI). We first give an overview of CICSPlex SM and the WUI. In Chapter 2, "CICSPlex SM installation" on page 13, we show an installation for first time users of CICSPlex SM and the WUI for CICSPlex SM V3.2. Chapter 3, "CICSPlex SM migration" on page 55, concentrates on how to migrate to CICSPlex SM V3.2. We discuss the migration best practices and show a migration step-by-step. This book also reviews the default menus delivered with the CICSPlex SM WUI and describes scenarios where these views could be used. We also discuss view modification and customization, focusing on such things as favorites and how to use the view editor. This book contains a chapter on problem determination. In that chapter we discuss problems that may be discovered and fixed using the CICSPlex SM WUI. Typical problems that we concentrate on are problems with files and in storage, as well as usage of the history facility. In the final few chapters of this book we look at CICSPlex SM security and describe how to implement SSL in the CICSPlex SM WUI. The last chapter of this book gives the reader some hints and tips on problems encountered, and considerations when using the CICSPlex SM WUI.